Products: FOODSAFE FLUSHING OIL FG-22 H-1, ISO 22, and Fully Synthetic. TGA experiments. The results are summarized herein. 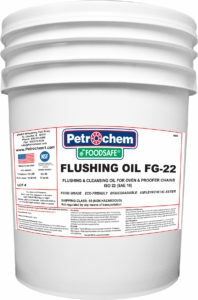 The primary benefit of FOODSAFE® FLUSHING OIL FG-22 is its ability to flush out old lubricant to convert to Petrochem’s Food Grade Chain Lubricants; soften, loosen and dissolve carbon residues on chains and all metal moving parts. Provides excellent Penetration, Solvency and Cleaning Power. provides excellent lubrication up to 1200°F. NSF H1 registered for incidental contact with food in and around food processing areas.